We’re Only As Good As Our People. 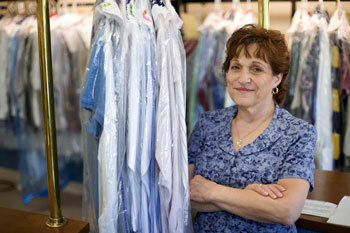 Every employee at Sunray Cleaners receives professional training by experts. And, to keep us all on our toes, we’re regularly inspected and audited by industry experts on a regular basis. It’s not easy to be the best, we work hard at it. Cleaning clothes is just one of our responsibilities. We know the power of a smile. After all, we’re here to serve you. And service with a smile keeps you coming back. The bonus: we care about your clothes as much as you do. Job satisfaction leads to customer satisfaction, we’re sure of it. If you find friendlier people working in Boston, please refer them to us. We offer a wide variety of dry cleaning, wet cleaning, linens, and shirt laundry to fit the individual needs of our clients. Including Boston, Jamaica Plain, Roslindale, Brookline, Newton, Dedham, Needham, Westwood, Nordwood, Milton, Hyde Park areas.